On this occasion I want to talk about this band from Holland, first when I hear the name of Bleeding Gods, their origin and the genre they play, immediately came to my mind names like Asphyx, Sinister and Thanatos all of them practicing a brutal and powerful Death metal, which defines the bands from that country, Bleeding Gods were formed at the end of 2012 and they are experienced musicians who have been played in bands such as Sinister, Supreme Pain, Deadcell, Houwitser, Mirdyn and Debauchery to name a few. 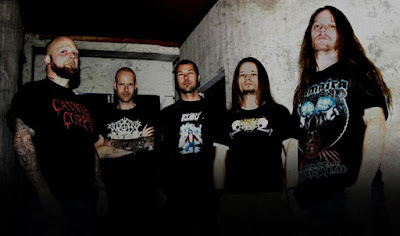 At the end of April 2013, they released their first EP entitled "Blood Symphony" the theme of their lyrics is based on war and history, ancient gods, the Mayans, the ancient Egyptians, Greek gods, etc. Bleeding Gods, play groovy riffs and a shredding Death metal with Thrash influences. 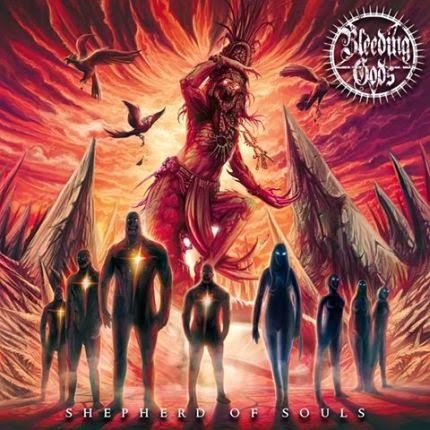 "Shepherd of Souls" is an album that contains a powerful, direct, and brutal Death metal without compromise, explosive drums, aggressive vocals and bestial guitars that puts you at the threshold of hell, the first track "Abyss of the World" fits perfectly with this description "Into the Depth of Misery" by mixing chord thrash with a Death metal lethal, the growling vocals are powerful inflicting pain to your senses, the track that gives title to the album "Shepherd of Souls" begins with a killer guitar riff, crushing unceasingly drums give proportion to this track that turns out to be catchy for the time being, "Rise from Ashes" is a track that dwells in the thrash metal side of the band, however they know how to infuse death metal essence in their notes, “Ixmucané (I)” effective! Sensitive! acoustic section, fits very well in this part of the album these notes, will take you to the next hell, “The Lords of Xibalbá (II)” definitely the track most thrasher in the album composed by sharp riff and unexpected speed changes are a constant in this song a true piece of Thrash metal, “Glorious Relentless Destiny” is a brutal thrash/death metal discharge in your face, powerful guitar riff along the song, relentless drums and a guitar solo, which takes you to the edge of the abyss, follows “Empire of the Immortals” this track keeps the spirit of the previous song, here you can hear a huge amount of riff, one after another a very solid piece, “Human Weakness” crushing guitars, blasting drumming, cryptic vocals well defined thrash/death metal song don't forget the furious guitar solo as dictates by the Old School Death Metal, “Symbolic Sculptures” great way to close a good album, excellent instrumentation seems like a mid pace song but almost at the end they release again their wrath to wreck down what remains of you. I am pleased to tell you that this is a great album full of good riff, appalling drums, bestial vocals and brilliant lyrics all mixed in a current, fresh and clean production but retaining the essence of the Old School Death metal, Bleeding Gods is a band that meets the expectations that only experienced musicians can provide, here there are no regrets, just a direct and brutal death metal uncompromised.